The planetary theory aspect appears a bit later, but first a brief review of some relevant details. (1) What is the period of a Jupiter(J)-Saturn(S)-Earth(E) (JSE) triple conjunction? JSE = 21 J-S or 382 J-E or 403 S-E conjunctions (21+382 = 403) in 417.166 years (as an average or mean value). (2) What is the period of a Jupiter(J)-Saturn(S)-Venus(V) (JSV) triple conjunction? JSV = 13 J-S or 398 J-V or 411 S-V conjunctions (13+398 = 411) in 258.245 years (as an average or mean value). Since JSV = 13 J-S and JSE = 21 J-S, the ratio of JSV:JSE is 13:21 exactly (in theory). As these are consecutive Fibonacci numbers, the ratio is almost 1:Phi or the golden ratio. These are the closest matches we can find for these planet trios. (3) JSMe = 5 J-S or 404 J-Me or 409 S-Me conjunctions (5+404 = 409) in 99.325 years (as an average or mean value). 5,13 and 21 are Fibonacci numbers, therefore this is a Phi-related progression. The numbers increase in order of each planet’s orbit period. Note also the non J-S numbers are clustered around 400 in each case. That implies an approximate Fibonacci/Phi ratio between them. The ratio is drawn from the number of J-S in the relevant row. For example J-Me (5 J-S line) should be near 13:5 with J-V (13 J-S line). In this case it works out as ~13.2 J-Me = 5 J-V. The closer the number, the closer the expected correlation. Consider 404 J-Me (5 J-S line) and 403 S-E (21 J-S line). ~21.054 J-Me = 5 S-E, near a 21:5 ratio. Then there’s Mars (Ma), which is a planetary neighbour of Jupiter. Being Mars, this works in a slightly different way, in terms of the numbers. (4) JSMa = 9 J-S or 80 J-Ma or 89 S-Ma (9+80 = 89) in 178.785 years (as an average or mean value). This is also the period in which the Sun returns to the barycentre of the solar system, as Gerry Pease explained here. Although 9 J-S is not a Fibonacci number, it consists of 3 Kepler ‘trigons’ (see illustration) of 3 J-S each, the well-known ~60 year cycle (3 is a Fibonacci number). 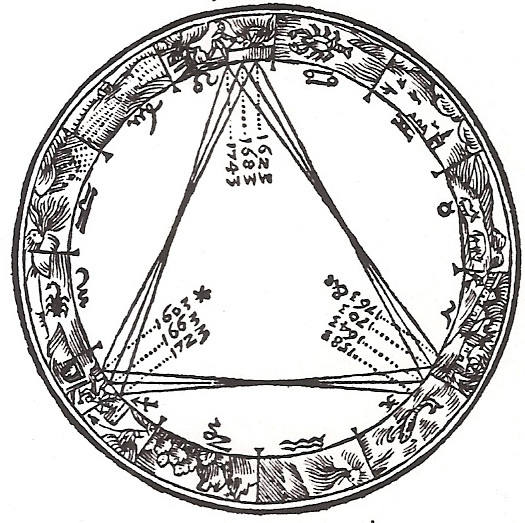 In one trigon the position of a J-S conjunction relative to the Sun moves by nearly 360 degrees (351.44 degrees). In other words it returns to nearly the same position every 3 J-S.
9 also falls midway between 5 and 13 i.e. (5+13)/2 = 9. All this begs the question of whether the inner planets have gravitated to their current orbits to fall into such harmonic relationships with one of the most powerful forces of the solar system, i.e. the Jupiter-Saturn conjunction with the Sun. We’ve already seen that with the four Galilean moons of Jupiter the critical factor was the 3:2:1 synodic ratio of the conjunctions. Another clear example of synodic ratios is the seven-planet resonance chain of the Trappist-1 exoplanet system. Note: Jupiter-Saturn-Mars configuration is similar at both dates. A graphic of the entire solar motion from 1811 to 1990 can be seen here, confirming no other arrivals at the barycentre during the period. Standing wave of energies of resonate frequencies. My first thought was, why is 8 missing. But then of course, 8 Earth orbits equals 5 Venus orbits. Where does it break down ? After Jupiter ? Is there a similar ratio between rate of spin ? But there Venus would perhaps not fit, but might do one day as it continues to slow, then maybe speed up in the opposite direction ? @JMartin; there are clues that Venus could not have evolved in it’s present position. Rotation in the wrong direction but “rapidly” slowing, so at sometime may begin rotation in the correct direction. Far too much atmosphere for it’s present position and size. Little or no internal magnetic field. This is no “Twin” of Earth but an entirely different animal that is learning it’s place…pg. J Martin – no, 8 Earth orbits = 13 Venus orbits (about one day short) = 5 V-E conjunctions. Mercury 0.241, Venus 0.615, Earth 1. A true Phi sequence would be: Me 0.236, V 0.618, E 1. We can see the two are very close. There’s no 0.382 (= 1 – 0.618) which would have made it equal ‘Phi steps’, but that’s just how it is. Another way of thinking about Venus is that it’s upside down. That might be part of the reason why it retains a very thick atmosphere despite having little or no magnetosphere, which we’re told is what protects Earth’s own atmosphere. I’ll do another post about the outer planets later, with the same theme. It doesn’t really ‘break down’, but outer planets are much further apart so the scale is different. These are the two very slow rotators, probably because they’re the most directly influenced by the Sun – which is itself a slow rotator. — 5 Venus days (583.75d) is almost the same as 1 Venus-Earth conjunction period (583.92d). Earth and Mars have very similar rotation periods, Mars about 40 minutes longer. The moon perhaps, or another planet that the arrival of Venus removed, on the assumption that Venus came from elsewhere, but then it would surely have a more extreme elliptical orbit. 5-13-21 misses out 8, but has two gaps of 8. Oldbrew, what are planetary harmonics doing exactly? are they causing sunspots? what is the relationship and the process that you’re trying to get across? I can make the same observations from all the grains of sand on the planet when it comes to ratios, I could just walk across to the beach now and start taking measurements. Sparks – see Wikipedia on orbital resonances as a starter. They don’t consider the resonance of planetary conjunctions, but stick to counting orbits. Sunspot origins are not resolved. There are only eight planets of significant size in our solar system as far as we know. This post looks at some of the conjunction patterns. 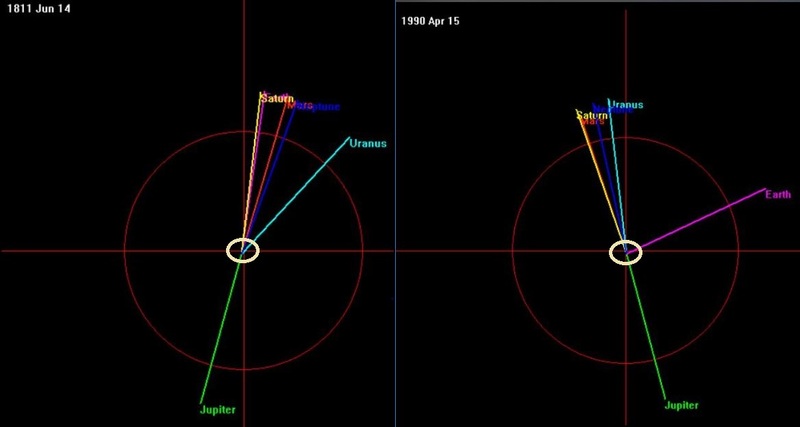 See the diagram below of the Kirkwood gaps, showing how Jupiter has cleared the solar system of bodies at resonant periods with its own orbit e.g. 2:1, 3:1. I’ve added some graphics at the end of the post to illustrate the planetary movements in the periods referred to. You know what I’m like by now, I want to know what the result is. How is all this practicable? Oldbrew, what does planetary harmonics do? basically be observed? it has no factor than observation, isn’t that correct? Practical use of an observational idea is a positive thing, that’s probably why I have torn you to shreds yet. Put me in moderation all you want… you’re just boring me and wasting my time. “They don’t consider the resonance of planetary conjunctions, but stick to counting orbits. Sunspot origins are not resolved”. They are on to you, what do you mean “Sunspot origins are not resolved” I’m curious, enlighten me. The sunspot cycle is irregular. harmonics, frequencies that are integer multiples of the fundamental frequency. Gliese 876 is a red dwarf approximately 15 light-years away from Earth in the constellation of Aquarius. It is the third-closest-known star to the Sun confirmed to possess a planetary system (after Proxima Centauri and Gliese 674 ) and the closest such system known to consist of multiple planets. As of 2011, four extrasolar planets have been found to orbit the star. The planetary system is also notable for the orbital properties of its planets. 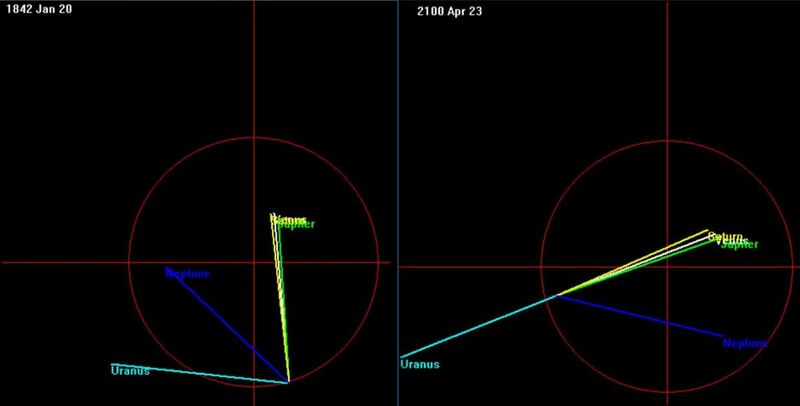 It is the only known system of orbital companions to exhibit a triple conjunction in the rare phenomenon of Laplace resonance (a type of resonance first noted in Jupiter’s inner three Galilean moons). It is also the first extrasolar system around a normal star with measured coplanarity. With the orbital info provided the conjunction ratio (not the orbital ratio) of the three resonant planets is 25:51:76. Re: ‘it is the only known system of orbital companions to exhibit a triple conjunction’ – see post above. It’s just longer time periods in the solar system. I will look into this further, unlike some people who are lazy, I’m not pointing any fingers or anything. You still haven’t replied to any of my questions with a direct answer, you have snipped at my humour and took unjustified offense for some unknown reason. Anyway enjoy the rest of your evening. Beyond coincidence it suggests that it’s to do with the distribution of rotational energy in the system. So, what could happen when Venus stops rotating? When is that likely to happen? Does it make any sense to have Venus’ spin as a negative? If Venus is upside down its rotation only appears to be retrograde. Its atmosphere rotates in about four days which has not so far been explained AFAIK. Re the study: Do weak global stresses synchronize earthquakes? These arguments have been going on since at least the 1970s. A 32.4 ± 1 year period could be three solar cycles, depending on which period is being studied, e.g. 20th C cycles were shorter on average than 19th C cycles so would be a better ‘fit’. “Venus rotates in the correct direction because it is upside down!” !!!!! There seems to be a lot of this upside down thinking in modern science. If the facts don’t fit the theory just turn them upside down and wa-la, problem solved! I can think of no astrological event that could flip an Earth sized planet upside down and leave it intact and in orbit. Sorry charlie, no cigar. Who said an event was needed? ‘Upside down’ just means ‘relative to its neighbours’. This is what we see. Planetary theory says Earth’s atmosphere depends on the magnetosphere repelling the solar wind, but Venus has no magnetosphere and still has by far the thickest atmosphere of the rocky planets. 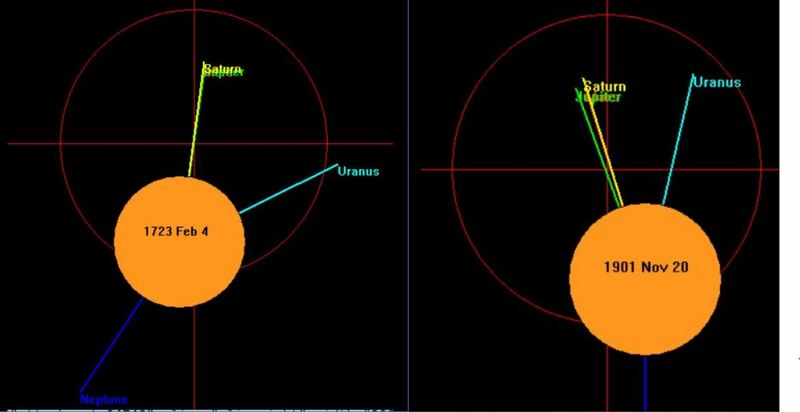 Uranus has the same characteristic as Venus which we see as retrograde rotation. True retrograde is Neptune’s giant moon Triton, which orbits its host planet the ‘wrong’ way as well. Venus may be boiling hot, but its poles are very, very cold. The European Space Agency found something surprising at the planet’s poles: temperatures more frigid than anywhere on Earth. Why Phi? ………………………… I see lots of mathematics as to it’s existence. I have as of yet to see a discussion as to why it exists. So again, Why Phi? 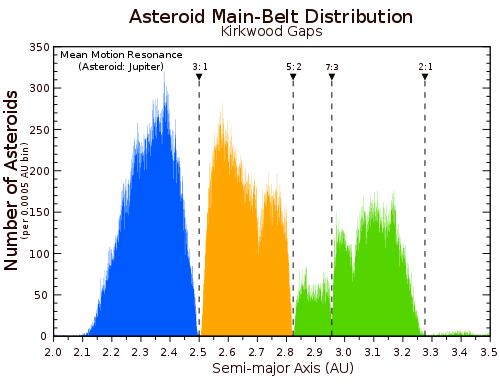 A Kirkwood gap is a gap or dip in the distribution of the semi-major axes (or equivalently of the orbital periods) of the orbits of main-belt asteroids. They correspond to the locations of orbital resonances with Jupiter. Exact numeric orbit period ratios e.g. 2:1 or 3:1 don’t work for smaller bodies vs. Jupiter. Caption: This histogram clearly shows the primary Kirkwood gaps in the asteroid main-belt. These gaps (labeled “3:1”, “5:2”, “7:3”, “2:1”) are caused by mean-motion resonances between an asteroid and Jupiter. For example, the 3:1 Kirkwood gap is located where the ratio of an asteroid’s orbital period to that of Jupiter is 3/1 (the asteroid completes 3 orbits for every 1 orbit of Jupiter). The effect of these mean-motion resonances is a change in the asteroid’s orbital elements (particularly semi-major axis) sufficient to create these gaps in semi-major axis space. Resonance and antiresonance are not synonymous.